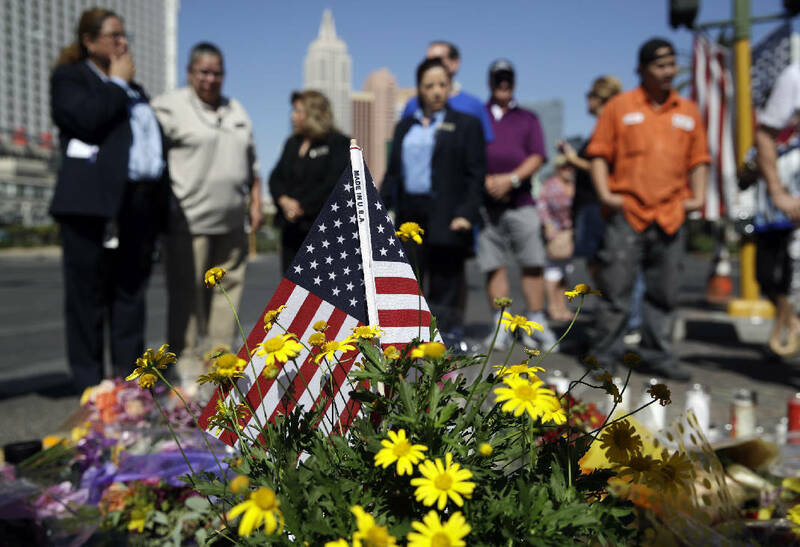 LAS VEGAS (AP) — The girlfriend of the Las Vegas gunman said Wednesday that she had no inkling of the massacre he was plotting when he sent her on a trip abroad to see her family. Marilou Danley issued the statement after returning from her native Philippines and being questioned for much of the day by FBI agents still trying to figure out what drove Stephen Paddock to open fire on 22,000 fans at a country music festival from his 32nd-floor hotel suite. "He never said anything to me or took any action that I was aware of that I understood in any way to be a warning that something horrible like this was going to happen," Danley said in a statement read by her lawyer outside FBI headquarters in Los Angeles. Danley, who was overseas for more than two weeks, said she was initially pleased when Paddock wired her money in the Philippines to buy a house for her family. But she later feared it was a way to break up with her. "It never occurred to me in any way whatsoever that he was planning violence against anyone," she said. Danley, 62, who has been called a person of interest by investigators, said she loved Paddock as a "kind, caring, quiet man" and hoped they would have a future together. She said she was devastated by the carnage and would cooperate with authorities as they struggle to get inside Paddock's mind. 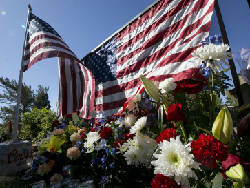 Investigators are busy reconstructing his life, behavior and the people he encountered in the weeks leading up to the deadliest mass shooting in modern U.S. history, FBI Deputy Director Andrew McCabe said. That includes examining his computer and cellphone. But as of Wednesday, investigators were unable to come up with a motive for the attack Sunday night. "This individual and this attack didn't leave the sort of immediately accessible thumbprints that you find on some mass casualty attacks," McCabe said. Paddock killed 58 people and wounded more than 500 others before killing himself in his room at the Mandalay Bay hotel casino, authorities said. The Associated Press previously reported that 59 victims were killed, but has received revised information from the Clark County coroner. The 64-year-old high-stakes gambler and real estate investor specifically requested an upper-floor room with a view of the music festival when he checked in last Thursday, according to a person who has seen hotel records turned over to investigators. The room, which goes for $590, was given to Paddock free because he was a good customer who wagered tens of thousands of dollars each time he visited the casino, the person said. It was just another indication of how methodically he planned the attack. Authorities have said he brought 23 weapons in 10 suitcases into the room and set up cameras inside and out to watch for police closing in on him. But investigators had little to work with in trying to determine what set him off. While he had a passion for high-stakes gambling at Nevada casinos, his game of choice was video poker, a relatively solitary pursuit with no dealer and no humans to play against. And while neighbors described Paddock as friendly, he wasn't close to them. "He was a private guy. That's why you can't find out anything about him," his brother, Eric Paddock, said from his home in Florida. As for what triggered the massacre, the brother said, "Something happened that drove him into the pit of hell." Casino regulators are looking closely at Paddock's gambling habits and checking their records to see whether he had any disputes with casinos or fellow patrons. In addition, investigators are examining a dozen financial reports filed in recent weeks when he bought more than $10,000 in casino chips. It was in a casino where Paddock met his girlfriend, who was a high-limit hostess for Club Paradise at the Atlantis Casino Resort Spa in Reno, Eric Paddock told The Washington Post. Stephen Paddock wired $100,000 to the Philippines days before the shooting, a U.S. official who was not authorized to speak publicly because of the continuing investigation said on condition of anonymity. Investigators are trying to trace that money. Danley's sisters in Australia said in a TV interview that they believe Paddock sent her away so she wouldn't interfere with his murderous plans. "I believe, based on what I have been told, the issue was not that he was under financial stress," said Sen. Claire McCaskill of Missouri, the ranking Democrat on the Homeland Security Committee. "Our souls are stricken with grief for every American who lost a husband or a wife, a mother or a father, a son or a daughter," he said. "We know that your sorrow feels endless. We stand together to help you carry your pain." Paddock had stockpiled 47 guns since 1982 and bought 33 of them, mostly rifles, over the past year alone, right up until three days before the attack, Jill Snyder, an agent with the federal Bureau of Alcohol, Tobacco, Firearms and Explosives, told CBS on Wednesday.